A dull and bloated drama, Circus World (also known as The Magnificent Showman) is a seemingly endless visit to the big tent, where the human interaction is lifeless and the characters uniformly uninteresting. It's early in the 1900s, and Matt Masters (John Wane) and his sidekick Cap Carson (Lloyd Nolan) run a circus operation. Steve McCabe (John Smith) is one of the handsome stars of the show, while young Toni (Claudia Cardinale) has a bit-part. Toni is being raised by Matt, after her father, the famous aerial acrobat Alfredo Alberto, died while performing and her mother Lili (Rita Hayworth) ran off. Matt and Lili were in love at the time, and Matt has never gotten over the great love of his life. Matt decides to take the circus on a tour of Europe, potentially because he is still looking for Lili. Disaster strikes at the first stop in Barcelona, when the transport ship capsizes and all of the circus equipment is lost. Matt, Cap, Steve and Toni have to start anew, and they accept work with a rival touring circus company with Matt maintaining his search for Lili while saving money to restart his own show. He connects with Toni's uncle Aldo Alfredo (Richard Conte), who may still blame Matt for his brother's death. Finally Matt and Lili do meet, with Lili living a destitute and nomadic life in Europe. Matt gives her the chance to restart her career, but both of them are unsure how to reintroduce Toni to her long-missing mother. Directed by Henry Hathaway and co-written by Ben Hecht, Circus World was an ambitious but troubled Samuel Bronston production. 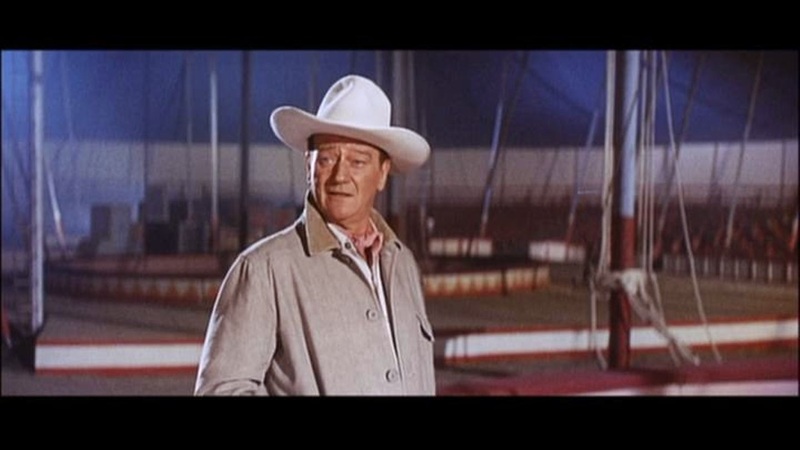 Originally slated to be directed by Frank Capra, the film attempted to safeguard the John Wayne persona within an entirely different milieu. It just does not work. Wayne struts around issuing orders and wanting badly for the circus to represent the wild west, but all around him the script is littered with cringe-inducing moments, witless drama, laughable dialogue and inconceivable character motivations. The problems are too many to overcome. Cardinale was 26 years old at the time of filming, and although she is game, she just can't pretend to be the teenager demanded by the script. The slow-burning, decades-spanning love that is supposed to simmer between Matt and Lili takes forever to materialize on the screen. Lili makes her appearance halfway through the 135 minutes of running time, and is then reduced to a few hesitant scenes. Hayworth was reportedly a horror to work with on the set, potentially suffering from both alcoholism and early symptoms of Alzheimer's disease, and she is neither convincing as a love interest nor as a trapeze artist making a comeback. John Smith as Steve McCabe is simply bland, and the attempts to spark a romance between McCabe and Toni falter. Worst of all, some of the film's key moments are simply flubbed: the causes of the incredibly sudden ship disaster are never even discussed, and the evil intent supposedly residing within Aldo Alfredo, who may have been behind scary threats against Toni as well as a damaging fire, is left completely unresolved. Hathaway at least makes the film look gorgeous, filmed in something called Super Technirama 70 (but promoted as Cinerama), Circus World is visually rich and saturated in colours, with an admirable level of kinetic energy sweeping across the screen, particularly in the numerous circus show segments. And Hathaway finally finds a pulse in the late catastrophic fire scene that injects some much needed momentum into the film. But Circus World is more circus show than real world, and it's ultimately down to the big animals and silly clowns to provide desperate relief from the turgid drama.